Backstage meet and greet with Emmy and Golden Globe nominated actress Kerry Washington and Two (2) tickets to American Son on Broadway. 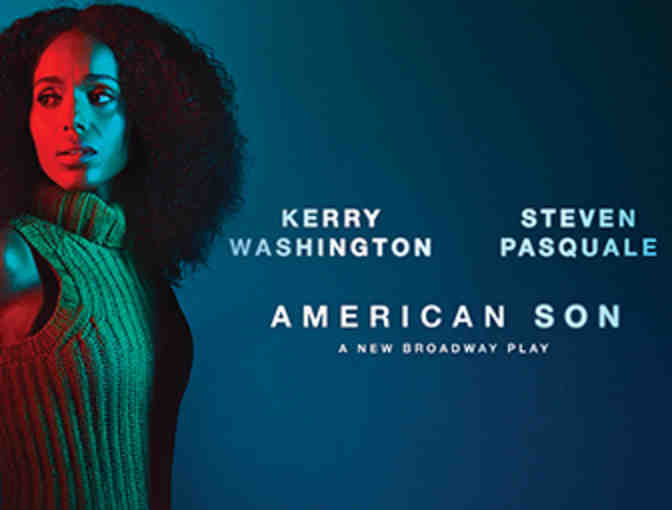 Kerry Washington returns to the Broadway stage alongside Steven Pasquale (“American Crime Story,” Junk), Eugene Lee (Gem of the Ocean), and Jeremy Jordan (“Supergirl,” Newsies), in the riveting new play, AMERICAN SON. Emmy, SAG and Golden Globe nominated actor, director, producer and activist Kerry Washington is a versatile and fearless multi-hyphenate who continues to astound with the depth of her talent. A native of The Bronx, New York, Washington has received high acclaim for her work in film, television, and theater. Washington received widespread public recognition for her role as Olivia Pope on the hit ABC drama Scandal, breaking barriers by becoming the first African-American woman since 1974 to headline a network TV drama. Over the course of seven seasons, Washington earned two Primetime Emmy nominations, a Golden Globe nomination, a SAG nomination and two NAACP Image Awards for her leading role on the Peabody Award-winning series. With steamy on-air chemistry and a flair for fashion, Washington turned Olivia Pope into an iconic character. Washington’s performances over the years have received many accolades, including nominations for the Independent Spirit Awards, People’s Choice Awards, MTV Movie Awards, and wins for the BET Awards, and Teen Choice Awards. Washington’s film credits include: Cars 3, Django Unchained, Ray, The Last King of Scotland, Save the Last Dance, Lift, For Colored Girls, Night Catches Us, Peeples, The Details, Mother and Child, Life is Hot in Cracktown, Lakeview Terrace, Miracle at St. Anna, Fantastic Four: Rise of the Silver, I Think I Love My Wife, The Dead Girl, Fantastic Four, Mr. & Mrs. Smith, and Our Song. In 2016, Washington launched her production company Simpson Street, which uses art, entertainment and technology to share narratives that amplify our common humanity while affirming the value of every individuals’ journey. Simpson Street’s first project, HBO’s Confirmation, earned Emmy, Golden Globe, NAACP Image Award and Screen Actors Guild Awards nominations. Simpson Street most recently launched the series Five Points on Facebook Watch and is currently developing several projects including Little Fires Everywhere with Hello Sunshine and HULU, 24-7 with UnbeliEVAble Entertainment and Universal Pictures, Old City Blues with HULU, The Mothers with Warner Bros., Goldie Vance, with Fox, and The Perfect Mother with Pascal Pictures. In 2009, Washington made her Broadway debut in David Mamet’s Race, alongside James Spader and David Alan Grier. This Fall, she will make her return to the stage in Christopher Demos-Brown’s American Son. The production will be directed by Tony winner Kenny Leon and Washington will star opposite Steven Pasquale, Eugene Lee and Jeremy Jordan. Washington is active in many social and political causes. She served on the President Obama’s Committee on the Arts and Humanities. In 2013, Washington was honored with the NAACP President’s Award, which recognized her special achievements in furthering the cause of civil rights and public service. In 2014, Time magazine included Washington on its annual Time 100 list of the Most Influential People in the World. Washington received the GLAAD Media Vanguard Award in 2015 and the ACLU Bill of Rights Award in 2016. Washington currently serves as both a brand ambassador and creative consultant for Neutrogena. COURTESY OF: Kerry Washington; The Drama League. PRIZE INCLUDES: two (2) tickets to American Son on Broadway; opportunity for a brief post-show meet-and-greet with Kerry Washington. RESTRICTIONS: Offer is subject to availability and blackout dates may apply. Scheduling must also be arranged and mutually agreed upon with Ms. Washington.